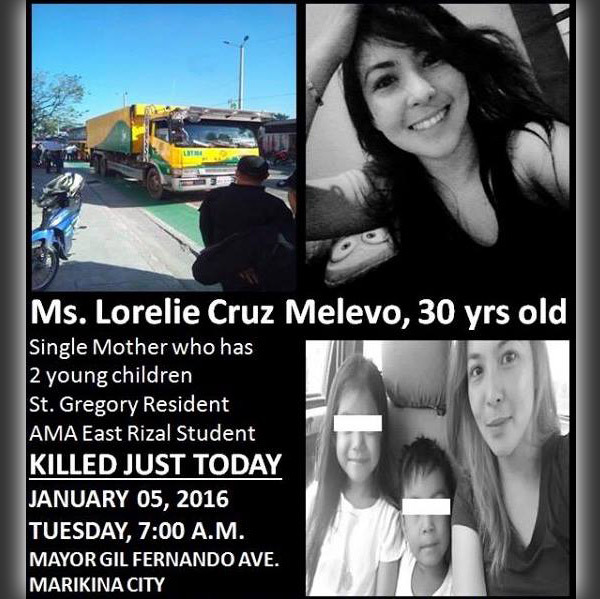 A government truck has run over and killed a cyclist, identified as Lorelie Cruz Melevo, on a bike lane along G. Fernando Avenue in Marikina. According to a Facebook post by journalist James Deakin, the 30-year-old mother of two was killed Tuesday, January 5, around 7 in the morning. 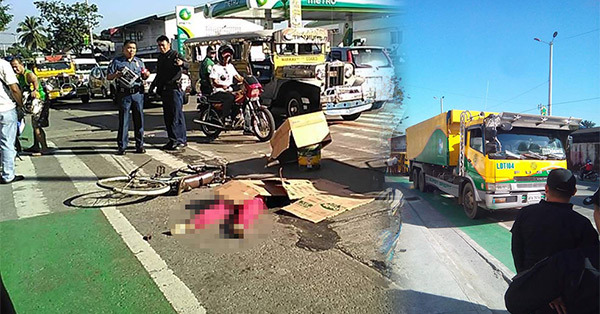 The truck driver, Jonathan Silverio Silverio, told cops that he did not notice the cyclist. He has been detained at the Marikina City Police Station, according to a GMA News report. Melevo's family, relatives, and friends cry for justice while Filipino bikers and netizens called for the establishment of protected and segregated bike lanes in the country. In an FB post, the administration, faculty and staff of San Roque Elementary School, where the victim was an alumna, said they were deeply saddened of her untimely demise. "We are one in calling for justice to Loreli. May her death be an eye opener to all motorists to respect traffic rules and bike lanes," the post read. According to one of her batchmates, Melevo's wake is at Midtown Chapel.